We are serious, but just a bit! I WANT TO MAKE A GAME! 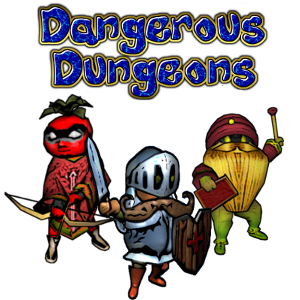 Dangerous Dungeons is a game about Dungeons which are very Dangerous! (O, RLY???) Put yourself in the peel of one of the vegetable heroes and enters in different dungeons, risking their own chlorophylla, for many different reasons! It may be for a greater good, like to prevent a mage to release a violent beast with nasty, big, pointy teeth! Or may it be for something more selfish, like to proof your own nobility! Potato Paladin: Member of the Northern Orthodox Heart Of Might Order, it was called by Potato Baroness to help in the capture of the evil mage called Bunnyman. While the Order urges for his execution, the Baroness insists that the execution is a barbarian, cruel and uncivilized punishment! After the escape of Bunnyman, The Potato Paladin's mission is simple: Enters in the Ebony Light Castle to prevent the vile mage Bunnyman to summon the 'rabbital' beast known as Ecco, which in the past, killed many members of the Order, now, Potato Paladin must decide if it will listen to the Law or Order! Mango Mage: Once a happy family fruit, its life was changed when a group of cows invaded its village, destroying everything and torturing everyone! (not necessarily in that order) As the only survivor, it wears it's scars as remembrance and swearing of revenge! Entering in the Oven Cave to take the s*it out of that cows...which actually...may help to rebuild its village! Tomato Thief: When captured while getting resources exclusively to fruits, its claimed it has the same right, since it is also a fruit. Of course, nobody belived in it, and it was convicted to a lifetime in prision as a legumen! After managed to escape, it goes straight to the Stewpot Forest looking for the Book of the Grand Chef which contains the truth of its own origin!